There are hardly words to describe this black beauty of a horse, she truly must be seen to be fully appreciated. Licorice's personality also cannot come through on film. When she reaches toward your hand so that you can stroke her luminous coat, her eyes soften and your heart will melt. As soft and sweet as she is, turn her loose and watch the magnificent power with which she moves; it is breathtaking. 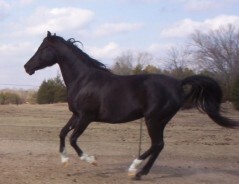 At every gait she has the animation and suspension that make her look as if she moves on springs. Add to all that her bold body, length of neck, gorgeous head and imposing height of 16 hands and you have a package to be envied. Licorice is as smart as she is beautiful and will excel at anything that is asked of her. She is Breeders Sweepstakes, so could easily win her purchase price back for you. If you are passionate about horse ownership, Licorice may be the horse for you. Contact us to see her in the flesh.